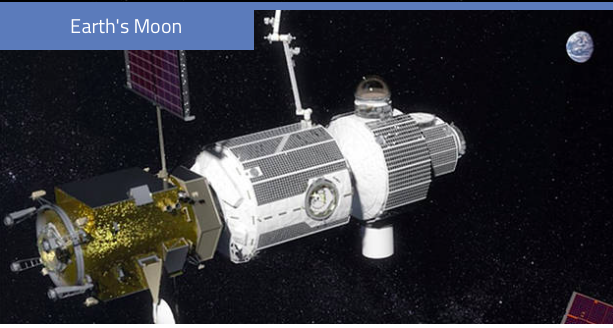 It's kinda like a gas station by the Moon, but it's also a manned communication center that will be orbiting the Moon that is smaller that the ISS and is anticipated to be completed by August 2019. The Lunar Orbital Platform will be the new manned platform following the International Space Station. Airbus has been awarded one of two parallel contracts by ESA for the phase A/B1 of the development of the ESPRIT. The activities were kicked-off in June 2018 and this phase is expected to be completed by August 2019. Chosen by Airbus Defence and Space, RUAG Space will be in charge of the development of the structure and thermal subsystem of the ESPRIT module — the European System Providing Refuelling, Infrastructure and Telecommunications for a station orbiting the Moon called Lunar Orbital Platform-Gateway. The launch of the ESPRIT module is planned for the end of 2023. ESPRIT is a module with a science air-lock, propellant storage and telecommunication capabilities and is one of two modules with which ESA will participate in this space station. The space gateway is the next structure to be launched by the partners of the International Space Station. After many years of successful collaboration between the space agencies of the USA (NASA), Russia (ROSCOSMOS), Canada (CSA), Japan (JAXA) and Europe (ESA) in the frame of the International Space Station (ISS), these five agencies are now planning their next step in the form of a station orbiting the Moon called Lunar Orbital Platform-Gateway. During the 2020s, it will be assembled and operated in the vicinity of the Moon, where it will move between different orbits and enable the most distant human space missions ever attempted. Placed farther from Earth than the current International Space Station —near the moon but not in a low lunar orbit — the gateway will offer a staging post for missions to the Moon and Mars.